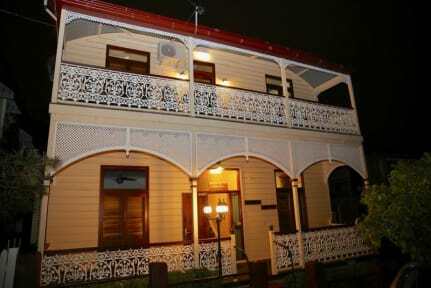 Brisbane’s Inner City Escape, Aussie Way Lodge is in a Heritage listed Colonial Style building constructed in 1872. It holds all the charms of its historic past blended with today necessities with its open verandas, classic design and wooden floors, with air-conditioning and free Wi-Fi. Aussie Way prides itself as a clean, safe environment with a no Alcohol Policy that ensures, all get a good nights sleep. It does however promote Brisbane’s top Entertainment and Nightclub District, shops, restaurants and cinema only a few minutes walk away. It is close to Suncorp Stadium and only a seven minute walk to the Brisbane City and Transit Centre, and after your flight, the Airport Shuttle will drop you at the front door. Aussie Way holds awards and high ratings from both Trip Advisor and Booking.com and offers a variety of room types, with singles, doubles, 4 bed dorm rooms and with group rooms available. There are TV rooms, kitchen facilities, tourist information, lockers for your valuables and on street parking available on request. 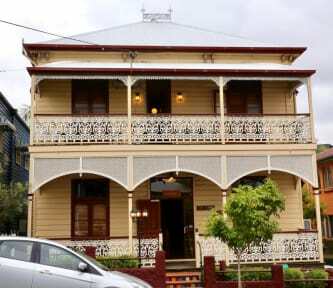 Students studying English and travelers searching for employment, use Aussie Way Lodge as a base, others use it as an escape from the journey and enjoy the quiet calm atmosphere and the many facilities this House has to offer, while they explore the many Brisbane sites. Aussie Way Lodge, operating for over 27 years, your “Inner City Escape”. We do not offer free car-parking in the city council area, however you can park in Cricket Street under the following conditions. You are free to park during the week from 7PM until 7AM, and for up to 2 hours at the same spot during the day. On Saturday and Sunday, you are free to park all day. Please take note that on event-days in Suncorp Stadium you can't park for more than 15 minutes from Midday until 10PM. You can check this on the Suncorp website. Please take in account that your car is your responsibility and that you should check the conditions upon arrival. We do not allow the use of alcohol on the premises. All guests are required to give a $20 deposit (in cash) for their key. This is refunded upon check-out at/or before 10 AM, provided you don’t lose your key. The property reserves the right to pre-authorize credit-cards prior to arrival. Please take note that all card transactions incur a 3% surcharge. Es un edificio viejo en muy buena condición y bien mantenido. El único punto bajo es la ducha del baño de hombres, es un poco incómoda y el flujo de agua no es constante.